David Arthur Roberts was born on September 11, 1944, in the small town of Gallipolis, Ohio, nestled on the Ohio River in the southeastern part of the state.3 After attending George Washington elementary school, he began high school at Gallia Academy, and in 1963 graduated from Central High School in Columbus, Ohio, where his parents had relocated. Attracted to baseball as a child, Roberts progressed through Little League, Pony League, and Babe Ruth League, but did not attract much attention as a pitcher on Central’s baseball team. Tall (6-feet-3) and sturdy (195 pounds), Roberts was also an excellent basketball player, earning All-Columbus honors. The hard-throwing southpaw’s performance in the 1963 American Legion state playoffs and subsequent selection to the All-Ohio Legion team caught the eyes of big-league scouts from the California Angels, Philadelphia Phillies, Pittsburgh Pirates, and the San Francisco Giants. After the tournament, Roberts signed with the Phillies on the recommendation of legendary team scout Tony Lucadello, whose signees included future Cy Young Award winners Fergie Jenkins and Mike Marshall, and MVP Mike Schmidt. Roberts began a frustrating, injury-filled six-year journey through the minor leagues in 1963 before he appeared as a midseason call-up with the expansion San Diego Padres, his fourth major-league organization. However, his career in Organized Baseball got off to a blazing start; he led the Class-A Western Carolina League in ERA (1.79) and won nine of 12 decisions for the Spartanburg (South Carolina) Phillies. Roberts was invited to Philadelphia’s spring training in 1964, but despite his promising future, the parent club gambled by not protecting him as stipulated by the first-year player rule in effect.4Consequently, the Pittsburgh Pirates acquired Roberts off waivers for $8,000. The Pirates thought they had a diamond in the rough in the 19-year-old fastballer. Roberts pitched almost year-round for the next three seasons, which may have contributed to his subsequent arm miseries. In his first full season of professional baseball, he posted a combined 8-10 record (3.96 ERA in 159 innings) for two teams in North Carolina, the Single-A Kinston Eagles (Carolina League) and Double-A Asheville Tourists (Southern League), in 1964. Roberts was clobbered in four starts (10.12 ERA) while pitching for his hometown Triple-A Columbus Jets of the International League to start the 1965 season, but he was sent back to Asheville and rebounded with a 9-8 record and a robust 2.93 ERA in 132 innings for the Tourists. After both seasons he got additional work in the Florida Instructional League. The promising lefty enjoyed a breakout season with the Tourists in 1966, ranking among the league leaders in wins (14), innings (190), strikeouts (157), and ERA (2.61), and earning a spot on the Southern League’s all-star team. Notwithstanding Roberts’s accomplishments, the Pirates, like the Phillies three seasons earlier, had failed to protect the young pitcher. The Kansas City Athletics, in need of strong arms, took him in the Rule 5 draft in November 1966. Looking forward to pitching in an organization where his chances of making the big-league roster seemed encouraging, Roberts reported to the A’s spring training coming off a commanding performance in the Dominican Winter League, where he posted a stellar 2.17 ERA in 108 innings and led Aguilas to the championship. However, his world came crashing down when he heard something “snap” in his left arm in an exhibition game against the Baltimore Orioles.5 Incapable of pitching and in agonizing pain, Roberts found his career in jeopardy. The A’s returned him to the Pirates organization for half of the draft price. Roberts garnered national exposure in a classic pitchers’ duel with the New York Mets’ Tom Seaver on August 11. While Seaver departed after hurling 10 scoreless frames and whiffing 14, Roberts tossed a career-best 12-inning complete game to shut out the Mets, 1-0. In the pitchers’ rematch 10 days later, Roberts held the Mets to three hits but lost a heartbreaker when Cleon Jones belted a solo home run with two outs in the ninth inning for New York’s 2-1 walk-off win. Described by Padres beat writer Paul Cour as the “hard luck player of the year,” Roberts lost 17 games for the NL’s worst team (61-100), but received only 22 runs of support in those games, including five shutouts. “The hardest thing in becoming a pitcher is gaining confidence,” said a reflective Roberts of his unexpected success. “It took me a few years to get [it].”16 In a move widely criticized by the Southern California press, the Padres shipped Roberts to the Houston Astros on December 3 for three prospects, pitchers Bill Greif and Mark Schaeffer, and lighthitting infielder Derrel Thomas. With the addition of Roberts, Houston’s staff was expected to be among the best in the league and boasted hard-throwing workhorses Larry Dierker and Don Wilson. Pitching coach Jim Owens praised the team’s prized acquisition: “[Roberts] moves the ball in and out as well as anyone we have. He doesn’t have one great pitch, but he has four real good ones. He has a good fastball—not a great one—but a good one. He has a good changeup and a screwball. And he has that quick slider. He has the real short one. Not many picthers can throw that short slider.”17 Widely tabbed as a possible 20-game winner, Roberts tossed several gems, such as three impressive shutouts (one of which was against his nemesis Seaver and the Mets) and a 10-inning complete-game victory over his former team, the Padres; however, his season was marked by inconsistency. “I know they are expecting a lot from me,” said Roberts. “You try not to feel it and tell yourself it doesn’t affect you, but really you know.” Relegated to the bullpen for the final three weeks of the season, Roberts finished with a winning record (12-7) for the third-place club, but his ERA (4.50) and hits per nine innings (10.6) were the highest in the major leagues among qualifying pitchers. Roberts rebounded in 1973, leading the Astros in wins (17) and ERA (2.85), and set a new team record with six shutouts for manager Leo Durocher, who reinstituted a four-man rotation in his first full season as the Astros’ skipper. “I’d say it [the shutout record] was kind of a fluke,” said the ever modest Roberts, a contact pitcher who yielded 9.5 hits per nine innings (seventh-highest in the NL). “But they [the defense] know the ball is going to be hit. I work fast and the defense stays alert.”18 With Roberts, Jerry Reuss, Don Wilson, and Ken Forsch, the fourth-place Astros (82-80 in the NL West) joined the Dodgers and Giants as the only NL teams that season boasting four starters who logged in excess of 200 innings. Many Astros players were happy to see the cantankerous Durocher leave after the 1973 season, but Roberts was not among them. He voiced his displeasure when his former Padres pilot and new Astros skipper Preston Gomez decided to go with an increasingly common five-man rotation. “I throw too hard when my arm is rested,” said Roberts, who was concerned about overthrowing and reinjuring his arm. “I’ve got to be tired and then the ball moves around.”19 Roberts made more news at the plate than on mound in the first month of the season, knocking in eight runs in his first six starts. Adept with the bat, Roberts once served as “designated pinch-hitter” for Elmira in the minor leagues, and batted a respectable .194 (103-for- 531) in his big-league career. On August 24 Roberts tossed the only one-hitter in his career, defeating the Philadelphia Phillies, 1-0, at the Astrodome. The shutout, his second consecutive, concluded a stretch of 26⅔ scoreless innings. Mired in fourth place, the Astros accelerated their youth movement in the latter half of September. The 29-year-old Roberts (who finished with a 10-12 record and 3.40 ERA in 204 innings) was relegated to the bullpen. The Astros finished in fourth place (81-81 in the NL West) and once again had four hurlers who logged in excess of 200 innings (Roberts, Dierker, Reuss, and Tom Griffin). After an offseason filled with rumors about his expendability or conversion to a reliever, Roberts reported to spring training in 1975 with his role on the team undefined. With no other viable southpaw starter, Gomez scrapped his plan of sending Roberts to the bullpen, but Roberts’s frustrations mounted. After two poor starts, Roberts went AWOL on May 9 in Montreal, drawing a suspension and a fine. “This is not a spur-of-the-moment decision,” said a discouraged Roberts. “This has been building up for years.”20 Roberts returned to the team five days later in Chicago, but never found his rhythm for the NL’s worst team (64-97). His record dipped to 8-14 and his ERA rose to 4.27 (sixth-highest in the NL) in 198⅓ innings. Preston Gomez had been fired as Houston’s manager in mid-August and replaced with Bill Virdon, who had just been released as manager of the New York Yankees. With just three appearances in September, Roberts anticipated being traded. On December 6 he was sent to the Detroit Tigers in a seven-player deal. Roberts, pitcher Jim Crawford, and catcher Milt May were swapped for catcher Terry Humphrey, outfielder Leon Roberts, and pitchers Mark Lemongello and Gene Pentz. Roberts’s first season in Detroit was a memorable one despite the team’s 74-87 record. While teammate Mark “The Bird” Fidrych captured the hearts and imagination of baseball fans across America with his antics on the mound, not to mention his superlative pitching, Roberts got off to a surprisingly good start. Replacing Tigers legend Mickey Lolich, who had been traded to the New York Mets in the offseason, Roberts tossed three complete games of three hits or less in his first eight starts, matching his career total from the previous seven years in the NL. He blanked the California Angels in Anaheim on two hits in his AL debut on April 17, and tossed another two-hitter 11 days later in his home debut in Tiger Stadium on the corner of Trumbull and Michigan Avenues, defeating the A’s 8-1 (the run was unearned). The venerable ballpark, with its natural grass, seemed ideally suited to Roberts’s sinkerball. Pitching consistently all season and battling severe knee pain in September, Roberts logged a team-high 252 innings, completed a careerbest 18 games, matched his career high with 36 starts, while winning 16 games (losing 17) and posting a 4.00 ERA. Just about 18 months after reaching the pinnacle of team success, Roberts was out of the big leagues. 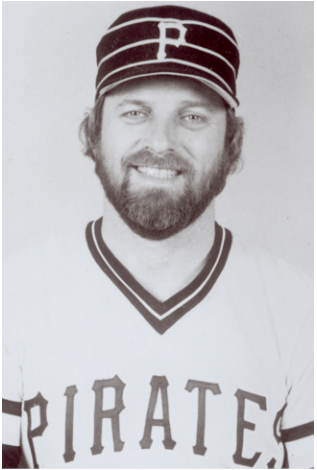 He relieved twice for the Pirates in 1980 before he was sold in a waiver transaction to the Seattle Mariners on April 24. After a brief stint with the Mets as a free agent in 1981, he was waived again. He subsequently signed with the Giants on June 15, three days after the beginning of the players’ strike, which resulted in the cancellation of about 38 percent of the season. He accepted an assignment to the Giants’ Triple-A affiliate in Phoenix of the Pacific Coast League, but retired after six appearances, and did not return to the big leagues. Roberts went 103-125, tossed 20 shutouts, and carved out a 3.78 ERA in 2,099 innings in his 13-year big-league career pitching for eight teams. He also won 70 games and logged 1,014 innings in the minors. A classic contact and control pitcher, Roberts struck out only 957 and walked just 615 while appearing in 445 major-league contests. 1. What’s in a name? As of 2015, there have been four players named Dave Roberts who have played in the big-leagues since 1962. Other than the pitcher profiled in his biography, there were two utility players and an outfielder. 2. The Sporting News, March 13, 1976: 38. 3. According to many sources, Roberts is considered Jewish; however, this claim seems to be incorrect. Roberts was born to a Jewish father and non-Jewish mother and raised by her and a non-Jewish stepfather. Even Reform Jewish congregations did not accept children of non-Jewish mothers; Orthodox and most Conservative congregations still do not today. Roberts was born as David Arthur Roth Jr., according to one source (Astro Databank, astro.com/astro-databank/Roberts, Dave). 5. The Sporting News, January 22, 1972: 40. 6. United Press International, “Pitcher Dave Roberts proves too much for Dodgers batters,” Redlands (California) Daily Facts, April 11, 1970: 11. 7. John Wilson, “Inside Dave Roberts’ Battle to Escape Oblivion,” Houston Chronicle. In Dave Roberts’s player file, in the National Baseball Hall of Fame and Museum. 8. Ron Roach (Associated Press), “Determination, prayer buoy Padres pitcher Dave Roberts,” Arizona Republic (Phoenix), June 18, 1970: 132. 12. The Sporting News, January 16, 1971: 59. 13. The Sporting News, September 11, 1971: 16. 16. The Sporting News, January 22, 1972: 40. 18. Michael A. Lutz (Associated Press), “Roberts Says Season Fluke,” Corsicana (Texas) Daily Sun, September 27, 1973: 12. 19. The Sporting News, April 27, 1974: 30. 20. The Sporting News, May 24, 1975: 21. 21. Richard L. Dancz, “Healthy Roberts Sees Tigers’ Rise,” Ludington (Michigan) Daily News, February, 1, 1977: 5. 22. The Sporting News, July 14, 1979: 18. 23. The Sporting News, July 14, 1979: 40. 24. Jenifer Langosch, “Former hurler Roberts passes away,” MLB.com. January 9, 2009. mlb.mlb.com/news/ article.jsp?ymd=20090109&content_id=3738241&vkey=news_ mlb&fext=.jsp&c_id=mlb. 25. The Sporting News, October 20, 1979: 22. 26. The Sporting News, December 22, 1979: 51. 27. Mike Mathews, “Former Major Leaguer, Coach Dies,” Cumberland (Maryland) Times-News, January 9, 2009.